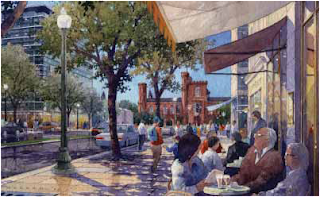 Southwest...The Little Quadrant That Could: 10th Street Corridor to Become an EcoDistrict? 10th Street Corridor to Become an EcoDistrict? A community of shared interest that sets environmental performance goals and carries out a plan to meet them. It’s an integrated neighborhood strategy to optimize resource efficiency, promote ecological resilience, and strengthen community engagement. Portland, Oregon has four demonstration projects underway utilizing these principles and the 10th Street corridor would be the first in DC to attempt to create a sustainable, mixed-use neighborhood in a federal enclave. The 10th Street corridor study area is bounded by Independence Avenue to the north, Maine Avenue to the south, 7th Street to the east and 12th Street to the west. The L'Enfant Plaza Metro station is the only one in the system where four lines intersect, plus there is a VRE stop in the area and the Smithsonian stop is at the western edge of the study area, so it has great transportation access. There is potential for a major overhaul of this underutilized area, which includes L'Enfant Plaza, the Department of Energy's headquarters, Reservation 113, and Banneker Overlook. The meeting will take place on February 2nd starting at 5:30 pm at NCPC's headquarters, located at 401 9th Street, NW, Suite 500. RSVP by February 1st by email (10thstreet@ncpc.gov) if you would like to attend. push for residential! you need to activate that space more than just 9-5! Pending Announcement Regarding Randall School?